A transit of Venus across the disk of the Sun is among the rarest of planetary alignments. The last transit occurred 120 years ago in 1882, while the next one takes place on 2004 June 08. Be ready ! An account of Venus elongation measurements by the Nehru Planetarium, New Delhi, team on the 29th of March 2004, as part of educational activities related to the Transit of Venus. 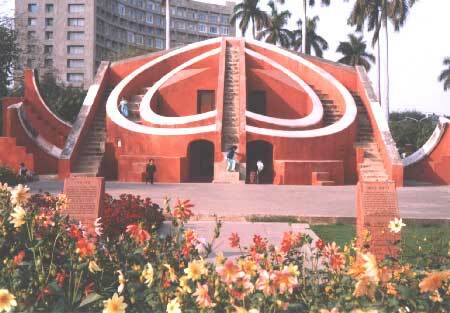 Jantar Mantar © Nehru Planetarium, New Delhi, India. The observers from the Nehru Planetarium, New Delhi included most of the staff – N. Rathnasree, Sanath Kumar,O.P.Gupta, M.K.Jain, K.Balachandran, Rajesh Harsh, R.K. Chhikara, Hukamchandra and Naresh Kumar. Two members of the Amateur Astronomers Association, New Delhi – Vikrant Narang and Kumar Gaurav assisted in the evening observations of Venus.